I did find one significant design flaw, which fortunately, is easily corrected. Since this amp came at the end of the vacuum tube era, design engineers were motivated to provide high line-input impedance, for compatibility with vacuum tube outputs. As a result, Eico used a 500K volume control to boost input impedance. (The input impedance spec is a modest 110K, however.) Rather than using another stage to buffer the input, Eico kept the line stages down to just two transistors. It turns out that the input current noise of the stage (Q201) following the volume control is sufficient to generate objectionable noise, when the pot is set to intermediate positions. It can make the source impedance as much as 125K. From listening, it sounds like most of it is flicker noise, which has been greatly reduced in modern, low-noise transistors. The 2N3391A transistor was considered a fairly low-noise transistor in its day but in this application, the noise was bad enough that the amp was practically unlistenable with headphones. Simply substituting a 2N5089 (left) for Q201 in both channels, cured the problem. Noise at the output of the amp at the worst volume setting went from 3.7mVrms to 0.65mVrms(400Hz to 30kHz). That goes from 71dB to 86dB below 20-watts (82dB on the other channel). The amp performs very well with headphones, now. 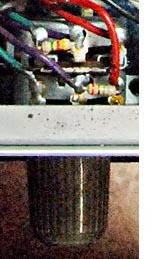 Click on the thumbnail at right, for a schematic of the phono preamp. By the way, when testing it, you might be surprised by a harmless oddity I found: It takes several seconds after power is applied, before the phono preamp is ready to go. That is caused by the time-constant of C101 and R106, which is 4.5-seconds. This must settle before the DC operating point of the phono preamp is correct. More about that loop later. I tested the RIAA equalization accuracy of the left phono preamp and initially found that it was +1.4dB at 20Hz and +1.9dB at 20kHz. [These numbers are the deviation from ideal response, referenced to 1kHz.] The spec shows ±0.5dB, 30Hz to 15kHz, so I was hopeful that it could do a lot better than measured. However, my first question was: How well should the circuit perform? A quick Spice simulation shows that the response is dead-on at 20kHz but +2.6dB at 20Hz. What gives? Apparently, the low frequency feedback resistor was adjusted to compensate for limited gain in the open-loop amplifier, saving the cost of a higher gain amp. The Spice sim was done for near-infinite gain. Skewing the RIAA network (specifically R105) for excess gain at low frequency can compensate for the amplifier limitation but it looks like Eico overdid it. So from the simulation of the RIAA network, I learned that (1) the design is off at low frequency, (2) the high frequency component values have drifted and (3) the low frequency components must compensate for limited amplifier gain. The problem with the last item, is that the accuracy of the open loop gain of the amp isn’t very dependable. That’s because it is affected by the beta of Q102 and loading on the tape output. Perhaps a prototype Eico used to adjust R105 had different gain, leading to the overcompensation. When faced with an RIAA response error, you always wonder whether components in the network have drifted. Note that C103/R104 (at left) are responsible for high frequencies and C105/R105 are for low frequencies. Generally, measuring components in-circuit isn’t accurate enough to look for drift and it’s a pain to unsolder them. What to do? If you have a good C-meter, which works at 1kHz or more and has D/Q measurement, here are a couple tricks: First, unsolder one side of R104. At this point, you can accurately measure the resistance of both R104 and R105. If you attach a clip lead between the outside nodes of the two caps, you can then accurately measure the sum of the caps, dominated by C105. (Error in C103 affects the percentage error in C105, 3.7X less.) Subtract 2.7nF, to get a pretty accurate estimate of C105. This works because R105 is high, compared to the reactance of C105. If that isn’t satisfying, you can unsolder one side of C103, letting you accurately measure both C103 and C105. So by unsoldering two leads, you can measure all four components. I substituted a 500K, 20-turn pot for R105 (at right) to address the low frequency issue. With leads bent appropriately, it fits in the existing holes for R105. I noticed that C103, which affects the high frequencies, is a high-K ceramic type, notorious for inaccuracy, drift and nonlinearity. It might be cheap but it’s not a good choice for an RIAA network. It should be replaced whether there happens to be a response error, or not. Since I didn’t have a 2.7nF replacement, I paralleled a 2.2nF film cap and a 470pF NP0 ceramic (above). After adjusting the pot for zero response error at 20Hz, the maximum RIAA error from 20Hz to 20kHz was +0.41dB (at 20kHz). The pot setting was measured to be 371K, quite different from Eico’s choice of 470K. The right channel phono preamp presented with +0.95dB error at 20Hz and +1.75dB at 20kHz, fairly similar to the left channel. I replaced C103, as above. Instead of installing a pot on this side, I found the resistor value for R105, which yielded minimum error at 20Hz. A value of 390K was best on this channel, yielding -0.14dB at 20Hz and +0.27dB at 20kHz, which were the maximum deviations in the band. For the phono cartridge to provide the correct frequency response, it is important to provide the required 47K load. Seeing that R101 is 68K implies that Eico expects the preamp input impedance (hereafter “Zin”) to make up part of the load. In fact, the preamp Zin would need to be 152K, ideally. Not requiring the preamp to have very high Zin saves cost but introduces a potential variable for input impedance. I was concerned that the frequency-selective feedback would change Zin over the audio band. To examine this, I used a new toy, the HP-4800A Vector Impedance Meter (left), to measure Zin versus frequency. The data charted above shows that the Zin remains reasonably close to the ideal 47K value over most of the audio band. There is a significant drop below 100Hz, due to the diminished negative feedback, though. However, at low frequencies, the inductive reactance of a magnetic cartridge becomes insignificant, compared to the load. As a result, this is no problem. Similarly, for the phase shift of the impedance. It was mentioned above that the phono preamp has a starting delay. This is because the 4.5-second time constant of C101 and R106, must settle before the bias is correct. But why is that long time-constant needed? It is much longer than would be needed for good response at 20Hz. The reason is that the designer chose to provide DC feedback with a shunt resistor (R106), to the input. That requires that AC be removed from that path by C107. It has a rolloff frequency on the order of 16Hz. The problem is that C101/R106 also applies lowpass filtering to that path. The presence of two poles would make the loop unstable, unless one of them (C101/R106) can eliminate the loop gain before the frequency is high enough that the second pole kicks in. Since there is a large amount of loop gain (perhaps 100X or more), the C101/R106 pole must start at a very low frequency, to have the loop gain down to 1X at 16Hz. That makes the C101/R106 time constant, very long. The Bass control however, was flat at left/right settings of -0.3 and +0.3. This represented too much error, resulting in poor looking square waves on one channel, when the other was set flat. Granted, the physical offset doesn’t look like much but I estimate that represents perhaps a 2dB discrepancy between channels. I don’t blame cost-cutting for this, as I suspect it isn’t atypical. We don’t notice it as much for controls with concentric knobs because, in theory you can adjust it out (though few would). The elimination of the concentric control could be considered a cost reduction but rather than making the tracking worse, it simply made us aware that it is an issue. If you want to blame something, let it be the specsmanship which led makers to push for ±15dB range, when ±10dB would have sufficed. The solution is to parallel a high value resistor between the wiper and one side of the control. If the knob must be offset positive (CW) for flat response, then a resistor is added from wiper to the left lug of the control, viewed from the front. For a knob needing negative (CCW) offset, one is added from wiper to the right lug of the control. To find the resistor values, the control is set to the center position and a decade resistor box is attached from wiper to the appropriate lug. In this example, the left channel needs a negative offset, so the connections are from wiper to the right lug on the front section of the Bass control. It required 2.0Mohms for a flat response (clean square wave). The right channel needs a positive offset, so the connections are from wiper to the left lug on the rear section of the Bass control. It required 4.15Mohms for a flat response. Then the nearest 5%, 1/4W values are soldered into place, as seen at left. The resulting frequency response at right is excellent, with about 0.4dB maximum deviation on the right channel (red). 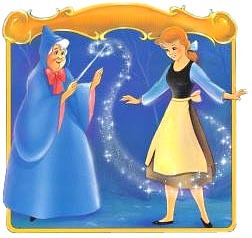 Of course, your particular controls would need different tweaks but the procedure is the same. It works for Bass or Treble, as long as the offset is minor (say, less than 0.5-units or so). The rocker switches are somewhat stiff and it pays to lubricate them with contact cleaner. In my unit, apparently the stiffness took its toll on the often-used Power switch. It was broken (but roughly working), as seen at left. The weak element is the pivot. 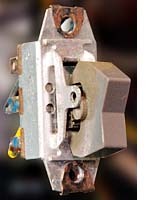 The plastic rocker is suspended by the metal tab with the hole, seen in the photo. A nub on the plastic is all that serves as an axle, turning in the hole. Eventually, that nub broke or wore down. I drilled a hole through the rocker with a Dremel drill stand as at right. Then used a metal brad (for picture hanging) as an axle. The head of the brad acts as a stop on one end and I bent and trimmed the other end. It works very well and is sturdier than before. I have noticed that the Cortina series products appearing on eBay are often missing the decorative aluminum caps on the ends of the knobs. (An original cap is seen at right.) It seems that Eico used a hard-setting adhesive to attach the caps. Over time, the different thermal expansion of the aluminum and plastic inevitably break the bonds and the caps fall off. The unit I bought was missing all six caps, so there was little hope of finding that many replacements, short of buying another complete unit. I contacted Tony at JTNS Enterprises, who agreed to fabricate replacements at a very reasonable price. JTNS makes such caps as standard products, for some other types of knobs. They also make the spun aluminum inserts for certain ST-series Eico knobs. 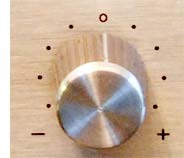 (See our article on ST-series knobs.) As it turns out these caps were harder to fabricate than Tony had thought. 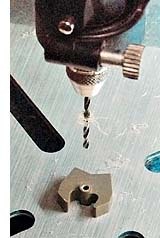 To produce them in quantity would require tooling. True to his word, though, Tony had the knobs machined, one by one, with no change in price. You can see the excellent results in the picture at the top of the page and in the closeup next to “Tweaking the Tone Controls,” above. (The picture just above shows the original cap.) Needless to say, that effort was worth far more than the original price charged. Rather than canceling the order (and refunding) as many companies would have, he persevered, producing all of the caps. Although it clearly wouldn’t make sense for JTNS to do more of these caps that way, they would be interested in producing tooling for them, if sufficient demand develops. Tony recommends using silicone adhesive to attach the caps and included a one-use packet for that. It remains flexible, avoiding the thermal expansion problem. I was a little concerned about how long it might take the adhesive to cure, in the semi-sealed space. I baked the glued knobs at 150F for two-hours. After that, the attachment seemed pretty strong. Change Q201 from 2N3391A to 2N5089. Replace R307 with a 100ohm trimmer pot and 120ohm 1/4W resistor, in series. Replace fuses F1 and F2 with 2A, fast-blow. Change C5,6 from 2000uF 25V to 4700uF 35V. Change the C103 capacitor type to film or film-plus-NP0-ceramic. Change R105 to 390K or substitute a 500K, 20-turn pot. Optionally, change R101 to 62K (see text). Add tweak resistors to the tone controls (see text). When output or driver transistors must be replaced, replace both output and both driver transistors with the substitutes listed in the table and add the three caps (47uF, 47pF, 390pF) shown in red on the schematic. Increase the bootstrap caps (C302–both channels). Presently 100uF, 25V, you could try 470uF, 35V, TVX1V471MCD, $1.05 at Mouser. Should fit. * Note: There is a dearth of axial-leaded 4700uF caps, greater than 50V. The only one at Mouser (63V) costs more than $10. Jameco has 50V units (#158811) for $2.49, that cuts it a bit close to the 45V actual measured supply voltage. Those would surely work, though. (It is the voltage Eico used.) An alternative would be to get a (more available) radial unit and add a lead to make it axial, wrapping it with heatshrink. Before applying power for the first time, set the new 100-ohm bias pots to minimum resistance. Apply power and adjust the bias pot for 20mV drop across R12 (left) or R11 (right). Allow the amp to warm up for 15-minutes and recheck the voltage drop. It might rise to around 25mA. If it is much higher, readjust for 25mA. Note that, after driving heavy loads, it might rise to 50mA or so. 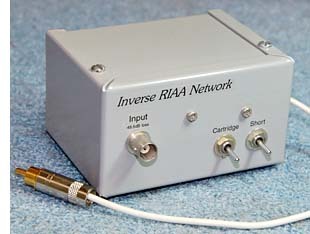 Connect the inverse RIAA network between an audio generator and the phono input. Set the generator to 1kHz and adjust its level for 1V RMS at the tape output. Set the generator to 20Hz, making sure that its output level does not change. Adjust the 500K pot for 1V RMS at the tape output. Recheck the level at 1kHz and iterate the adjustment, if needed. Connect an audio generator to the phono input. Set the generator to 1kHz and adjust its level for 108mV RMS at the tape output.